Current USA Orbit Marine Led Fixture 36"-48"
Ships tomorrow if ordered in the next 22 hours and 40 minutes! Right from the start, there’s a lot to love about the Orbit Marine. It’s simple, yet fully controllable. Thin and sleek, yet powerful and bright. It can do things you never thought an aquarium light could do - all programmed from the comfort of your couch. 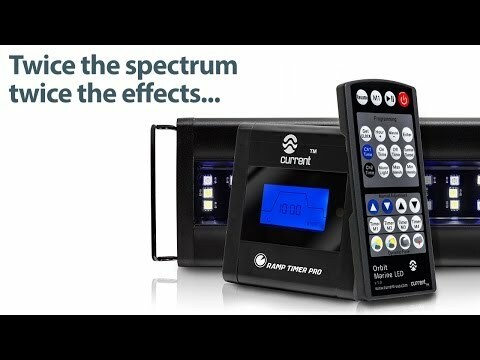 By combining the industry’s first Dual Daylight and Dual Actinic LED spectrums with our innovative Ramp Timer Pro™ LED controller, Current USA offers a complete 24 hour aquarium lighting solution. Now you can simulate a gradual sunrise, sunset and customized moonlight like never before. Designed specifically for saltwater aquarium environments, the Orbit Marine is the perfect choice for marine aquarists at any level. Fits Aquariums 36" - 48"
Questions on Current USA Orbit Marine Led Fixture 36"-48"
I'm putting together a 210 FOWLR and was wondering how these would be, tank is 72x24x29. Would you use 2 of these or 2 of the 24"-36". Do you have a suspension kit that goes with or would I have to customize my own. Thank You. I have a 40 gallon breeder tank that I want to put this on. I will have soft corals and fish. Live rock as well. Will this work good on that tank? Would you suggest the 36-48 to get maximum coverage? Thoughts? This fixture will be fine for soft corals and fish. Definitely go with full size fixture to maximize coverage. You're reviewing: Current USA Orbit Marine Led Fixture 36"-48"
Current USA Orbit Marine IC PRO with Bluetooth Controller 18"-24"
Current USA Orbit Marine IC LED System with Bluetooth Controller 18"- 24"
Current USA Orbit Marine Led Fixture 48"-60"